The first county seat was established was at Crystal Springs, but was short lived, it was moved to Hiko in 1867. Mining booms draw respect and the desire to be the center of county government. Pioche wrested the title from Hiko on February 24th, 1871. Lincoln county has significant historic interest. Between 1540 and 1775, the Spaniards explored through the southwest region. Then in 1863 a local Indian revealed a good specimen of silver ore to, “Famous Scout, Prospector, Expert Rifleman, and Missionary to the Indians,” William Hamblin. 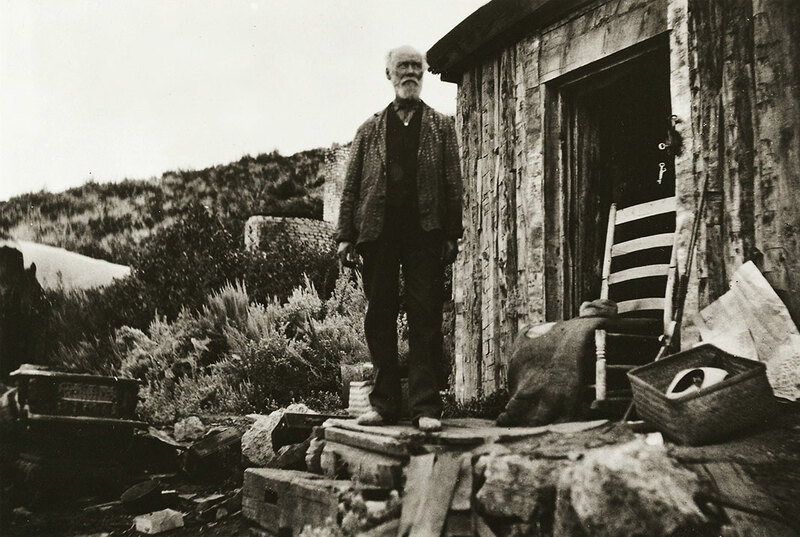 Now Hamblin was one of those, ‘Mormons’, who founded Gunlock, Utah, in 1857 and came to Clover Valley in the early 60’s, and was said to be the first white man to settle in Meadow Valley. Later in 1872, Hamblin would be an essential witness in the court battles between Raymond & Ely and the Hermes Mining Company over control of the mineral wealth in the camp. However, before he could testify, he was administered a lethal drink. Realizing he had been poisoned he started for home in Gunlock, Utah. After reaching Barclay in Clover Valley he could travel no farther, and he died there. Hamblin was buried in the Barclay cemetery. On Hamblin’s first visit to the deposits in 1863, he managed to take samples and make several locations. 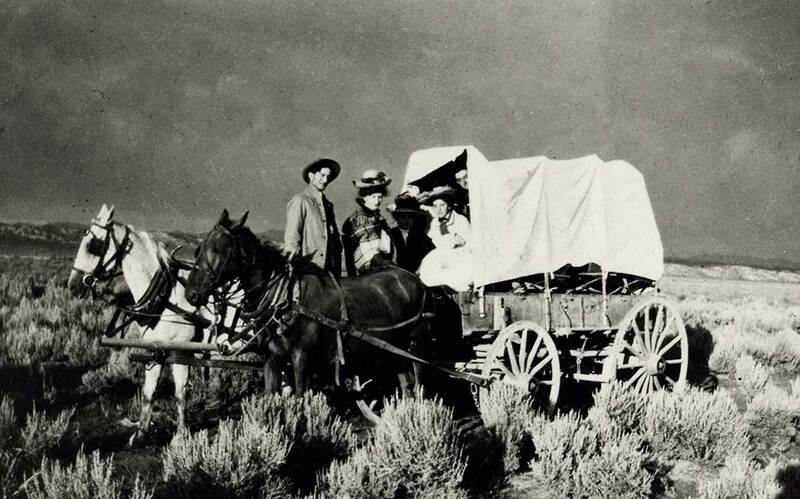 He then transferred his samples to Salt Lake City; the result of this would be several expeditions to the region, which established the Meadow Valley Mining District. The first expedition was in April 1864 by J. M. Vandermark and Stephen Sherwood who organized the Meadow Valley Mining District. Not to be dispossessed by Gentiles, Brigham Young ordered Erastus Snow from St. George to Meadow Valley with a company of men, who in lacking a mining recorder organized a new district with new rules. A third company, chiefly of men from the California Volunteers, followed, and the former rules of the Vandermark and Sherwood party were restored. The presence of so many Mormons made the place distasteful. The district was abandoned by Gentiles after some work had already been done on the Panaca, the original discovery ledge. The first recorded claim was the ‘Panacker’, and the surrounding area was called the Panaca Flats. There were several delays due to the Civil War. Indians became annoyed with all the white men invading their land. More delays were caused by the length of time it took to get mining equipment shipped from San Francisco by way of Cape Horn. There was very little work done between ’64 to the early part of ’68. Very little development had been started by the time the news of the strike at Panaca Flats reached Europe. In the spring of ’68, Francois L. A. Pioche, San Francisco financier, sent Chas. 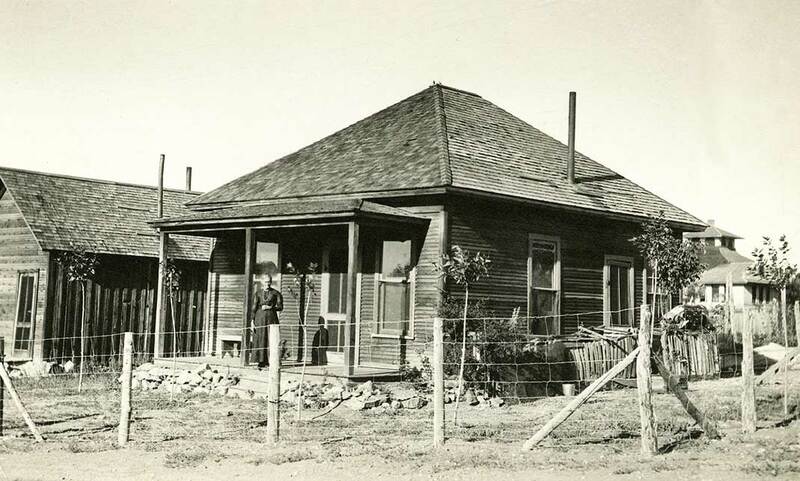 E. Hoffman out to purchase the property, which was incorporated as the Meadow Valley Mining Company. This is one of the two great mining companies that in the late 70’s, became rivals and came to be more famous in the world than the big Bonanza itself. In 1869 newcomers John H. Ely and William H. Raymond arrived in camp. 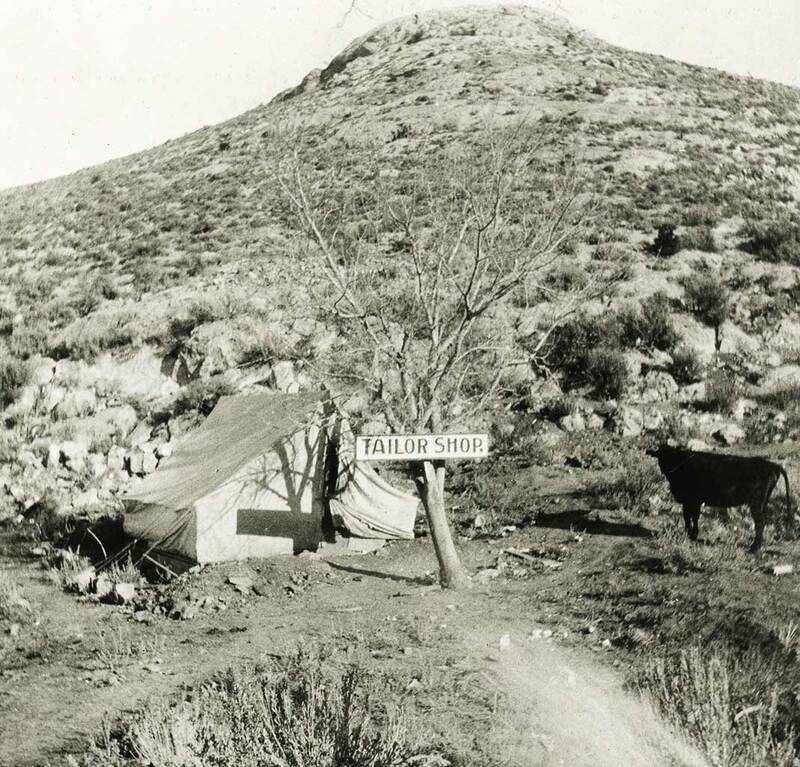 They were operating down in Pahranagat Valley and had spent what little they had just to reach Pioche’s camp. After entering camp they met up with two brothers by the name of Edward and Pat Burke, who just happened to have a very rich claim. This led to some serious dickering, and Ely and Raymond ended up owning the claim. Before this, Ely and Raymond were running a little five-stamp mill down at Hiko, but because of the low-grade ore in the area, the mill was a failure. They went down the hill about twelve miles or so to the Mormon camp of Panaca, where they talked a few Mormons into going to Hiko and hauling the mill up. The Mormons would be paid after the first sale of bullion. 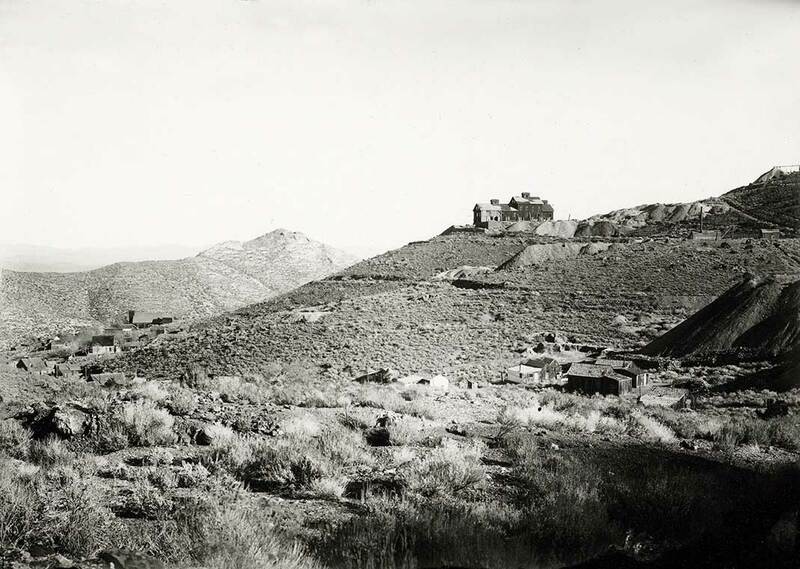 The mill was to be set up on a sloping hillside where they had an abundance of water, between Pioche and Panaca. This site would later come to be known as Bullionville. This worked out great. Not only did they get all of their ore milled but the Mormons delivered ore from their mine as well. The rapidly growing funds from this enterprise led Ely and Raymond to not only pay off the Mormons but liquidate all of their debts as well. In the following months they organized a company which became known as the famous Raymond & Ely. These two great rival properties continued producing ore abundantly until 1876. 1872 was their banner year for production. It is not possible to ascertain how much was realized from the mines in that or any other year. 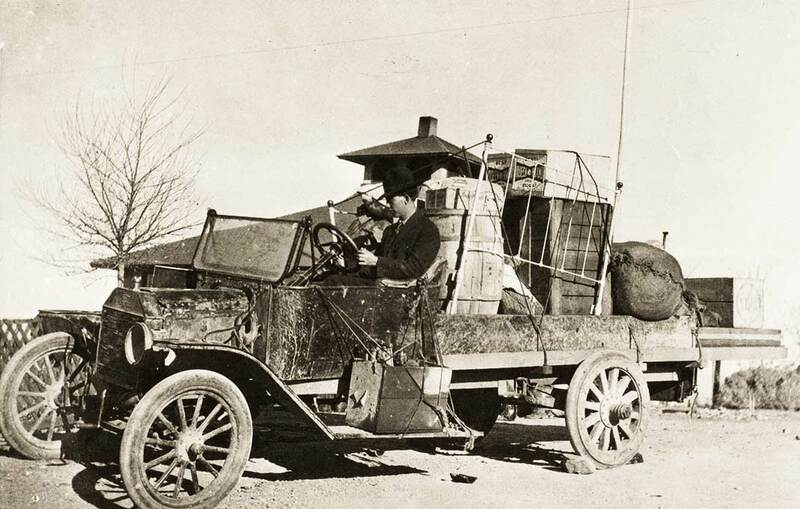 Nevada mining law states that you had to file a return with the County Assessor’s office for bullion produced in the county. In ’72 the returns for Lincoln County, of which Pioche is now county Seat, aggregated about $6,000,000. Since these returns were for the purpose of assessment and taxation, it would be unreasonable to believe that full returns were made. Given the facts that all bullion was shipped to the outside world before it was converted into cash, and that all of the cash was to be kept at the Company’s headquarters in San Francisco. In those days it was not necessary to keep any records at the local office in Pioche. What do you think? Bullionville became a major point for all of the Raymond & Ely ore and from many other claims in the district. 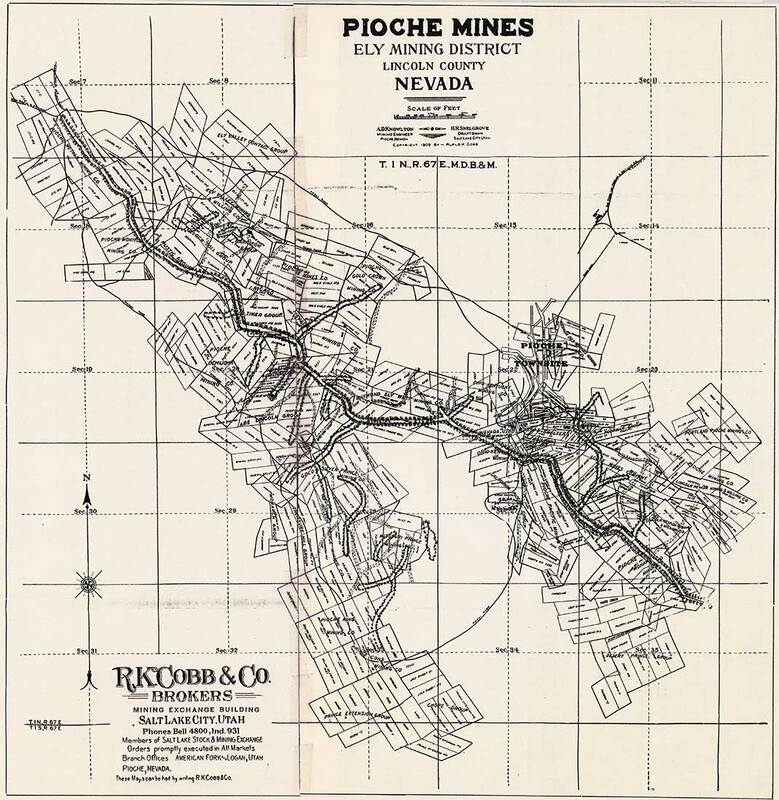 The Meadow Valley ore was treated in a splendid mill which the company built some ten miles northeast of Pioche in Dry Valley where they sunk a well to obtain water. 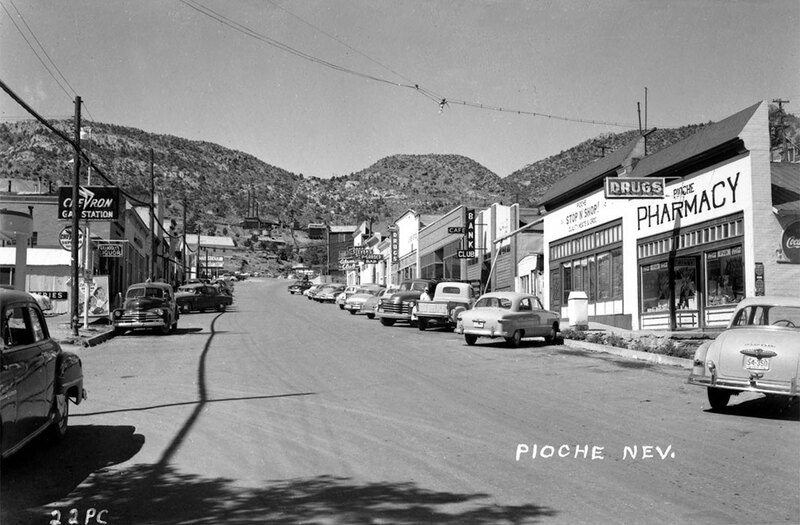 ’72 was the height of the boom for Pioche, which had about 6,000 residents. 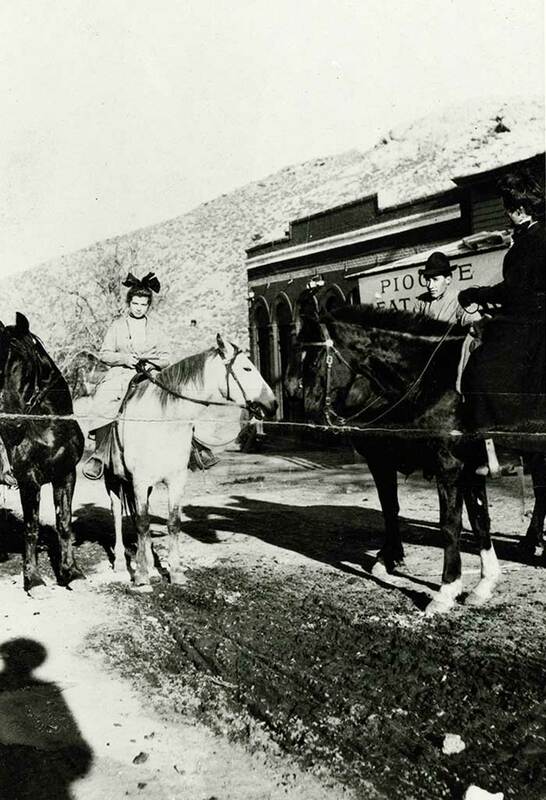 Pioche had a daily line of six-horse Concord coaches carrying U. S. Mail and Wells Fargo express to the Central City R. R. at Palisade, going through Hamilton in White Pine County. A similar line ran to Salt Lake, both of them owned Gilmer & Salisbury. Three daily lines, with two of them running six-horse Concord coaches to Bullionville. Three railroads were organized to build lines into Pioche- The Salt Lake, Sevier Valley &Pioche Railroad (which was a Mormon line) and the Palisade, Eureka & Pioche, controlled by D. O. Mills from the north, and another from the south. 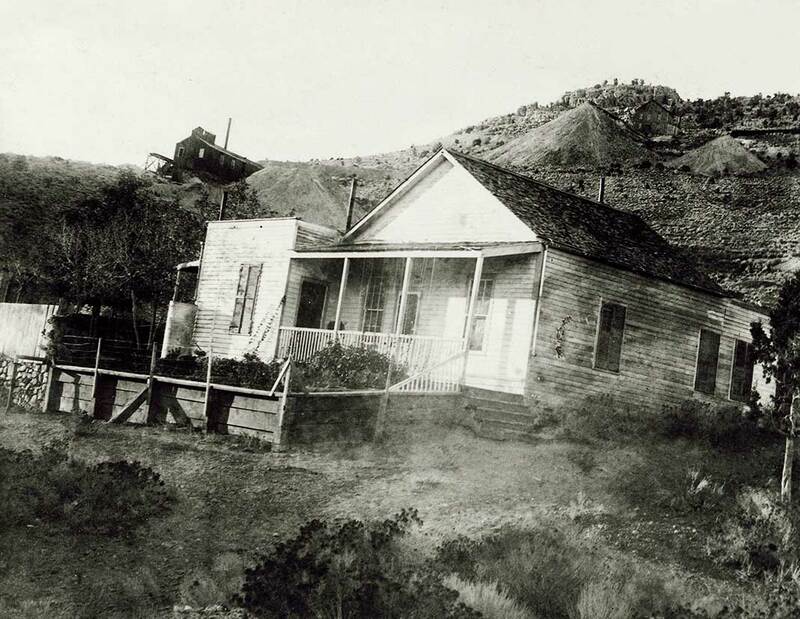 In addition, there were two telegraph offices- the Western Union to San Francisco by way of Palisade and the Desert Telegraph (Brigham’s) through Salt Lake City. 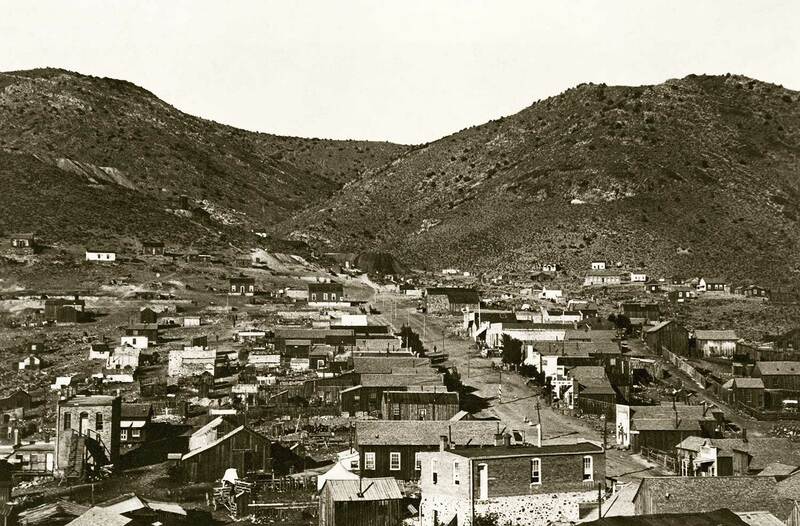 The town had 32 steam hoists with a chorus of whistles, a fast freight line running day and night giving delivery in five days, their own narrow gauge railroad from Pioche to Bullionville running on past the mills at Dry Valley and through Condor Canyon. Take all of this and throw in two daily newspapers with associated press services. This all was the means for getting in and out in a growing town. The town itself already had 78 graves in the cemetery of men it was said died a violent death. Along with the population it maintained, 72 saloons, 3 hurdy-gurdy houses, 32 maisons de joie, two theaters, two breweries, two gravity fed water systems with street mains and fire plugs, two fire companies and a livery stable maintaining 300 horses. The Million-Dollar courthouse was designed by Edward Danahue and was built in 1871. It was constructed of brick, stone, and borders on the ‘Classic Revival’ style of architecture. Originally contracted and budgeted to cost $16,000, the courthouse politicians produced ‘cost over runs’ from the git-go and soon delayed payments with mounting interest, it didn’t take long to balloon into a Million Dollar price. Known there after as the Million-Dollar courthouse, it was finally paid off in 1936. When we were in Pioche, taking our photos, I had a chance to talk to the curator of the courthouse Louis Benezet. Louis was very knowledgeable of the history, helped us out on a little problem we had finding out any thing about the Finlay pump station going to Delamar. He took us on a tour of the courthouse, which was very impressive with the jailhouse in the rear. The jail had steel floors with 16 inch walls and windows so small it was hard just to see out. Louis told me that no one ever got out of this one. When you think of all the towns in the west, full of outlaws with shootouts and murders alike, you have to think of Pioche. 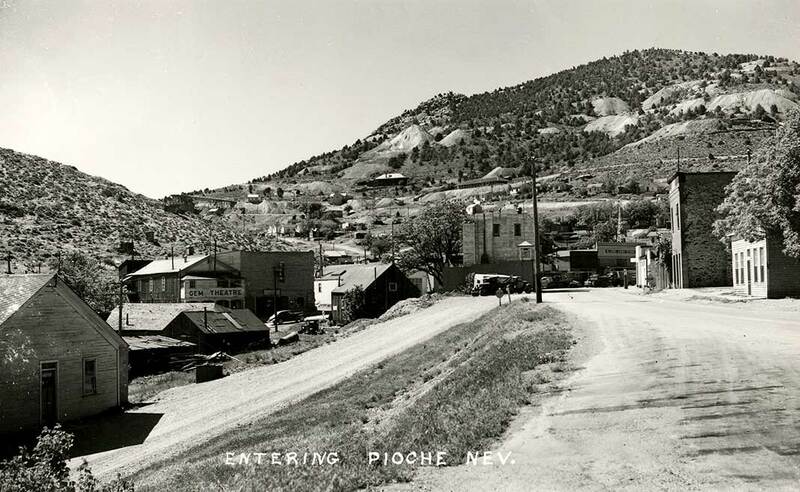 At one time Pioche was rated one of the badest towns in the west. They have a list hanging in the courthouse showing who all died here , not counting Hank Parrish. Parrish was arrested in 1890 for killing P. G. Thompson at Royal City, but he was convicted and hanged in Ely on the 12th day of December. Most of the big name outlaws of that time had come through Pioche one time or another. However, when they started building the old courthouse, the big boom was over. 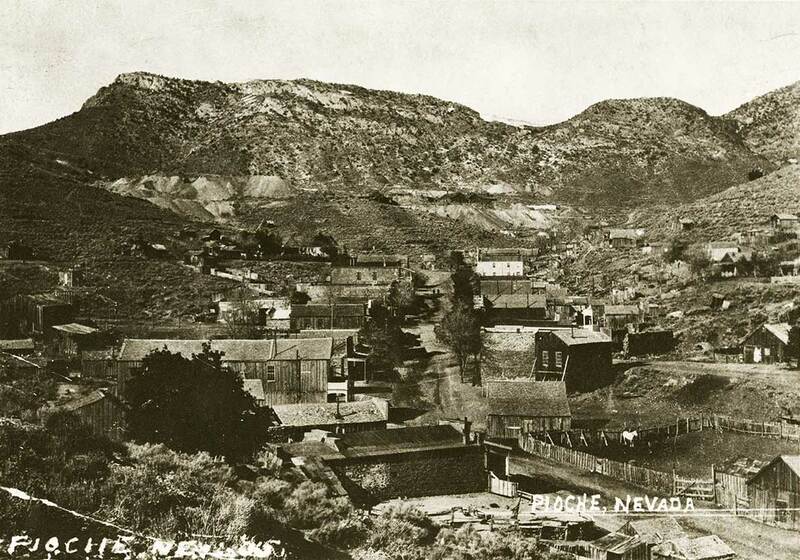 Although Pioche never died, it burnt up and flooded several times. One of the major fires, 15th of September 1871, was just after a day of glorifying the occasion of the Mexican Independence. Shortly after midnight flames were seen to issue from the rear of a restaurant on Main Street. However, the fire was not the worst of it. Stored in the cellar of a leading mercantile store were 300 pounds of powder. When the powder went off it gave a shock that shook the surrounding mountains to the core. Some historians say there were thirteen killed and forty-seven injured, but the older writings lead me to believe that may be exaggerated. Any way the reports were that some 200 to 300 people remembered what it was like to sleep out under the stars again- at a cost of $500,000 . As if this was not bad enough, again 5th of May 1872, the town lost twelve buildings at a cost of $50,000. This was followed by the twenty-second of August 1873, when a flood occurred after receiving 3.4 inches of rain within two hour, with damage at $10,000. 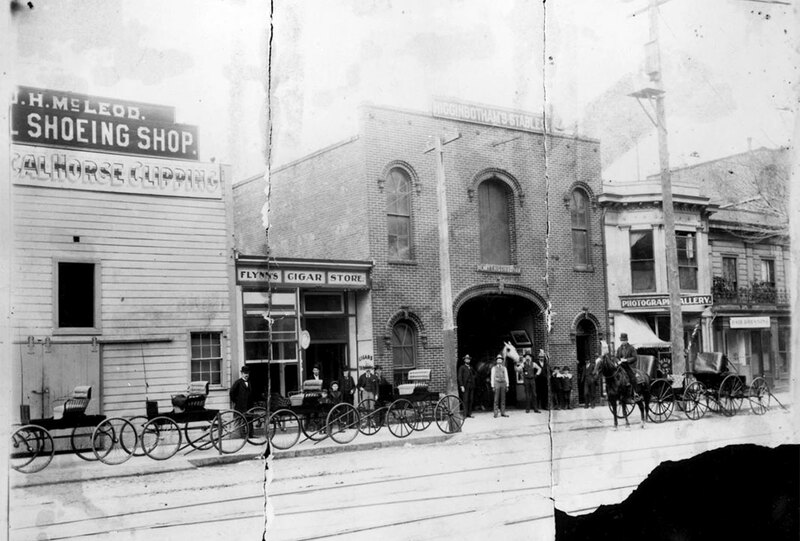 On the morning of May 3rd, 1876 a destructive fire ripped through the town, causing the loss of twenty-one buildings and an estimated $40,000 in damages. Another one of the interesting points I liked was the old tram. The tram operated during the 20’s and 30’s, carrying ore from Treasure Hill down to the Godbe’s mill in the Valley. 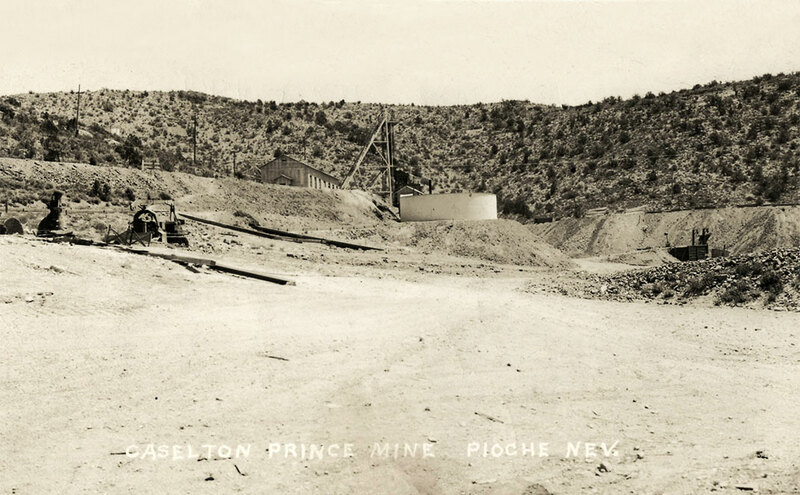 It was built by the Pioche Mines Company and used mainly gravity, powered with the aid of a five horse motor. The ore in the full buckets rolled down hill to the mill with enough momentum to return the empty bucket back to the bin. This led to a cheap cost of six cents a ton delivery, much to their liking. During World War II profitable lead-zinc deposits were developed. The town never said quit, and still to this day there are about 750 people living there, give or take a few.